I’ve become a growing fan of the games created by Falcom lately. They’re best known for the Ys and Legend of Heroes series, and their roots go way back to the early 80s of Japanese computer games. Falcom’s games don’t have the largest budgets or production qualities, but they are all filled with heart and charm. I’ve been playing Ys VIII: Lacrimosa of Dana, the latest game in the Ys series. I noticed there is DLC available for the game, which had me excited. But then I saw what the DLC is, and my heart sank. To be precise, there are 38 pieces of DLC available for the game. They vary in price from $1.99 to $0.99, with two of them being free to download. None of the items have a real impact on the game. They are all either visual accessories for the characters (for example, swimwear) or consumable items that can be purchased or crafted in the game. The accessories are $1.99 a piece for each individual character. So if you wanted to buy all of the pirate costumes for the six main characters, it would cost ~$12. That’s a lot to ask for a handful of textures when I paid $40 for the full game on Vita. The consumable items are quite vexing, as it isn’t clear what they are for. The “Ys VIII - Tempest Set 3” is available for $1.49, and the only info in the description is “A set of Tempest Elixir x6.” The content that they ostensibly want me to buy has next-to-no information on what it is and why I should buy it. I can’t help but wonder, who is this DLC for and why would anyone buy it? 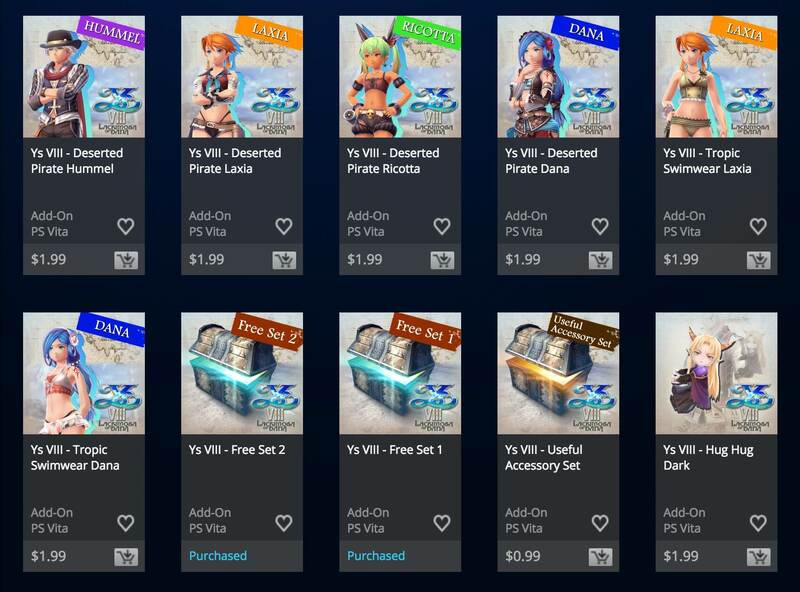 As someone who is loving Ys VIII, I’d be thrilled to support Falcom and the game’s publisher by buying DLC, but I’m not going to buy a bunch of overpriced items and costumes. If there was, let’s say, a bundle of all of the costumes and bonus items for $5, I’d be more into it. But there’s no way I’m going to go through 38 pieces of downloadable content and determine what I should buy and shouldn’t. It makes no sense. I like the idea of DLC, in theory. Expanding upon the story content and features within a game, especially post-launch is awesome. Seeing a game that I love get supported after it’s released makes me want to spend more money on it. Buying a bunch of consumable items and costumes for an RPG isn’t something I’m interested in doing. This is a larger problem than just Ys VIII, though. Ys VIII was published in North America by NIS America. Tokyo Xanadu, another Falcom game that recently got released in the West, is published by Aksys Games. It has even more DLC than Ys VIII available for purchase–62 pieces of DLC. Similar to Ys VIII, the items are accessories and consumables. I don’t think I’ll be buying the “High accessory set” for $2.99 anytime soon. Even the Trails of Cold Steel games have similar amounts of DLC. At least Trails of Cold Steel II has two “Mega Bundles” available for $29.99 and $19.99 respectively. That pricing is ridiculous, but at least it’d be easy to purchase it if one wanted to. What kills me about this sort of approach to DLC is that it clogs up the stores when searching for the game. It makes it difficult to actually find the game when I’m looking for it. 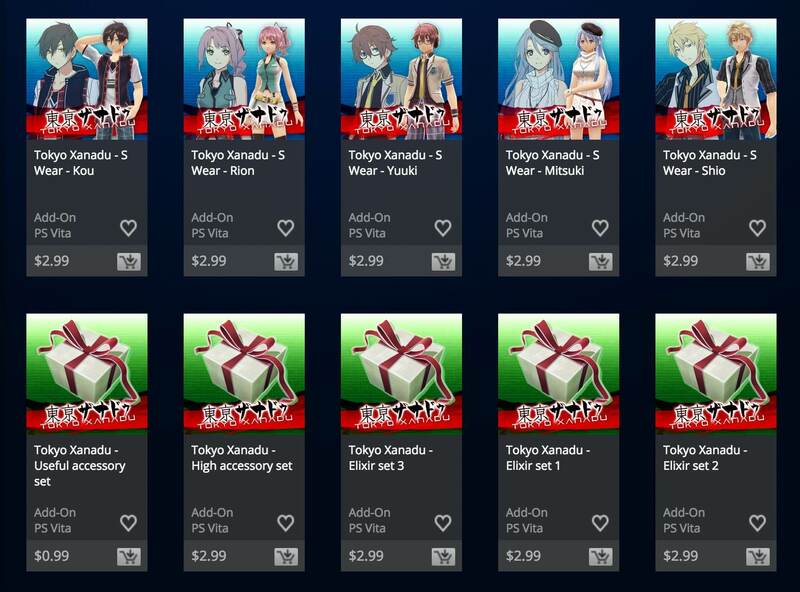 Searching for “Trails of Cold Steel” on the PlayStation Store returns 672 items. Neither the first nor second game are listed in the first four pages of results. That seems nuts to me. Why would you want to bury your game under hundreds of DLC items and avatars? Also, buying a bunch of consumable items for the game just makes it easier. Those items can be earned in-game anyways. Again, who is buying this DLC? I want Falcom to be successful and keep making games. But I absolutely will not spend money on DLC that basically amounts to spam. I hope that Falcom and other developers (cough Bandai Namco’s Tales of series cough) stop creating DLC that adds no value to the game. I would love to see them instead create downloadable content that expands upon the game by adding side story scenarios or new post-game dungeons. Or, at the very least, they need to stop charging a ridiculous amount of money for valueless DLC items.